Download this cheat sheet and you will also receive paper & print inspiration, easy-to-digest tips & tricks, and expert insights regularly delivered to your inbox. with this handy Packaging Cheat Sheet. When it comes to designing packaging set-up boxes and folding cartons are the two most commonly used options, and understanding their differences can help you set the right tone and feel for your packaging project. Tackle the humble folding carton – from the complicated tuck end to the slick and unassuming sleeve. Or consider set-up boxes that leave you the flexibility to determine exactly how your package will be unveiled to the customer. 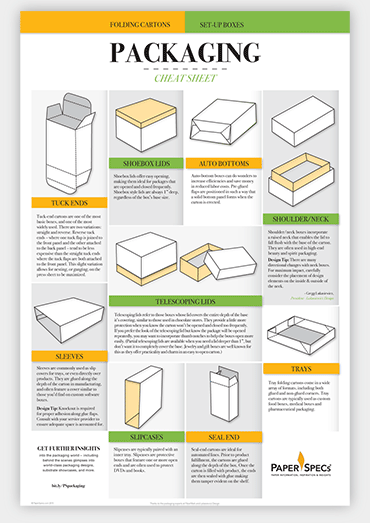 Keep all of your Folding Carton/Set-up Box options close at hand with this handy Packaging Cheat Sheet.